Verizon AAA discount! If you need to know if Verizon Wireless offers AAA discounts? You are in the right place. The AAA organization represents the American Automobile Association, Inc., which offers discounts to its members on thousands of brands and services. This article answers your question and tells you about the AAA Membership, and shows you other providers offer AAA discounts on cell phone service plans, phones, and phone accessories. Entertainments such as concerts, theaters, and attractions. And up to 45% discounts at over eight thousand local and national brands. The AAA is a federation of affiliated automobile clubs, and each AAA club represents an independent, non-profit organization. AAA offers services to keep its members save on the road. The AAA membership starting from about $50 for the basic membership according to your location and you can have the Plus or the Premium membership for higher prices. The membership price change according to your ZIP code. Verizon AAA Discount Exist or Not? 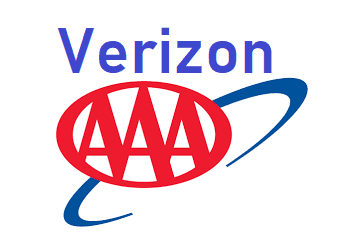 Unfortunately, there is no Verizon AAA discount at the current time. In other words, there is no active agreement between Verizon Wireless and the AAA organization. Also, there is no Verizon FIOS AAA discount. But if you are looking to save money with Verizon Wireless you can check out the Verizon senior plans such as the Verizon nationwide 65 plus plans and the new Verizon 55 plus plans. Also, Verizon does offer discounts for employees of many companies have agreements with Verizon Wireless. Other cell phone service providers such as Sprint Wireless and Affinity Cellular offers AAA discounts on their cell phone service plans, the cell phones, and, the phone accessories. For more information check out the AAA cell phone discounts.